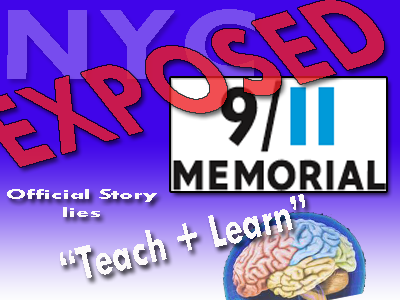 The grand opening of the globalist 9/11 Memorial Museum is scheduled for Wednesday May 21, 2014 at ground zero in New York City. Despite the post-9/11 world that we live in; one in which we've witness a massive awakening of humanity. A time period when many average Americans have experienced massive changes in their lives due to the broken economy. At a time when America's wealth has dwindled or should we say, transferred to the pocketbooks of unaccountable globalist gangsters. At a time when perpetual war is the norm despite the fact that we know that the Iraq war was based on a WMD lie, and we know factually that the World Trade Center towers were destroyed by controlled demolition. And since we know factually that Bin Laden didn't own his own controlled demolition company we can mathematically and factually state that Bin Laden did not cause the damage that occurred at the World Trade Center lending full credence to the statement: '9/11 was an inside job'.